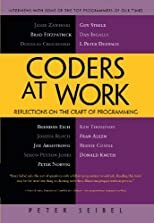 As an interview-based book, Coders at Work does a pretty good job at exploring the minds, memories and practices of an impressive bunch of software old timers. To me, the main downside of this book is that it is, with a few exceptions, mainly focused on a pretty homogeneous group of people, i.e. US-based coders who started on PDP-*. The book could have used a little more diversity because it's main value lies in the analysis that us, the readers, will do while reading about the lives of these arch-coders. More diversity would have made the commonality between top coders more salient, while in the book, commonalities feel they occur simply because most of these people worked at the same period of time on the same type of machines. Besides that, it's definitely worth the read.